The British Isles are filled with pioneering cheesemakers who thrive on blending tradition with innovation to create tantalizing new tastes that delight the senses. Exotically unusual, Coombe Castle Thai Curry Cheddar achieves this careful balancing act of flavor with intoxicating flair. 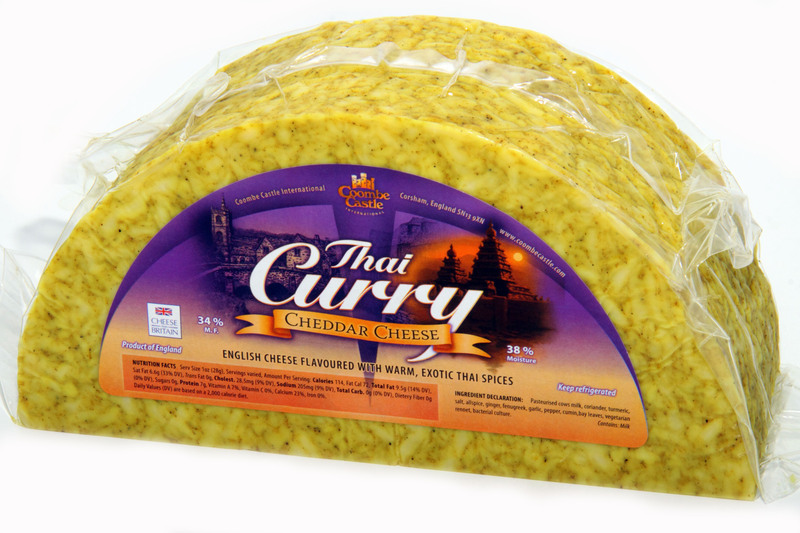 Coombe Castle Thai Curry Cheddar combines the richly aromatic flavors of the East: coriander, turmeric, salt, allspice, ginger, fenugreek, garlic, pepper, cumin, and bay leaves, with one of England’s treasured cheeses. The cheddar selected for this merger has the exact right sharpness to perfectly foil the zesty curry, allowing the cheese and spices to meld beautifully into a unique East meets West taste sensation that is smooth and inviting on the tongue. As eye-catching as it is flavorful, the white cheddar is mottled with a vibrant yellow-green. 4 of the 5 senses have been factored so far and the last one is easy. It’s the sound of the sheer enjoyment of it all. Mmmmmmm. Made with pasteurized cow’s milk, Coombe Castle Thai Curry is suitable for vegetarians. Application: A stand-out on any cheeseboard, Coombe Castle Thai Curry is a wonderful snacking cheese but its firm, crumbly texture also makes it great to grate into salads, melt over chicken or potato dishes or add an exotic twist to mac and cheese and ham sandwiches. Pairing: Pairs best with white wines, especially those with a touch of sweetness and good acidity. Try a German Riesling or a Chenin Blanc. Award-winning Duhaime Gourmet, located in Québec, Canada, has three generations of food innovators behind its current cheese spread success. Tart lemons are featured for their fresh citrus taste in this all-natural spread that is sweetened with pure Canadian maple syrup and organic sugar. The tangy fruit is complemented by vanilla and a kick of black pepper for a tantalizingly sweet, savory and spicy mix of flavors. 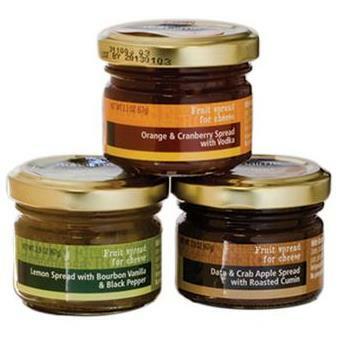 Duhaime’s Lemon spread is made for all types of cheeses and adds intrigue to any occasion.